KNOCKAROUNDS elastic shorts in your choice of cotton twill or denim! relaxed, roomy fit long inseam for good coverage full elastic waist with inside drawstring side slash pockets two button-through back patch pockets button closure with zip fly garment washed cotton twill or stonewashed cotton denim machine wash; imported Mens shorts in big sizes XL, 2XL, 3XL, 4XL, 5XL, 6XL, 7XL, 8XL; tall sizes L, XL, 2XL, 3XL, 4XL, 5XL, 6XL Big: inseam length - about 8" Tall: inseam length - about 10" Read more: Our awesome spring shorts offer a relaxed fit and full elastic waistband for total comfort! Inside drawstring means you customize your own fit, making these a great option for guys who like a lot of breathing room. Available in several colors, these are a great casual option -- stock up for summer! Wear them with a polo or graphic tee. On a summer night out they would even look great with a short sleeve sport shirt! 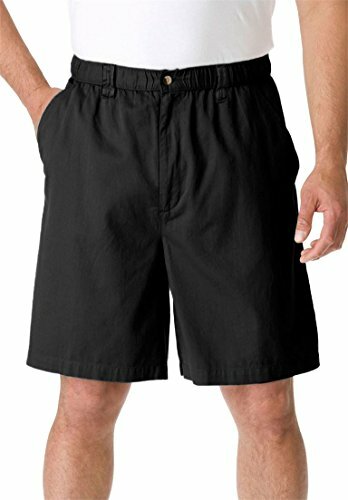 Reasons to Buy: Customers love these shorts for the confidence and relaxation the elastic waistband and drawstring give them. Some have bought ten pairs!